Loving the sleek design of the Sound Intone i65 Headphones! Hey there. As most of you know, I’m a huge fan of music. So I listen to music for about 5 hours a day, if not more. This puts me in prime position to test out new headphones for long periods of time so that I can check out what works and what doesn’t. 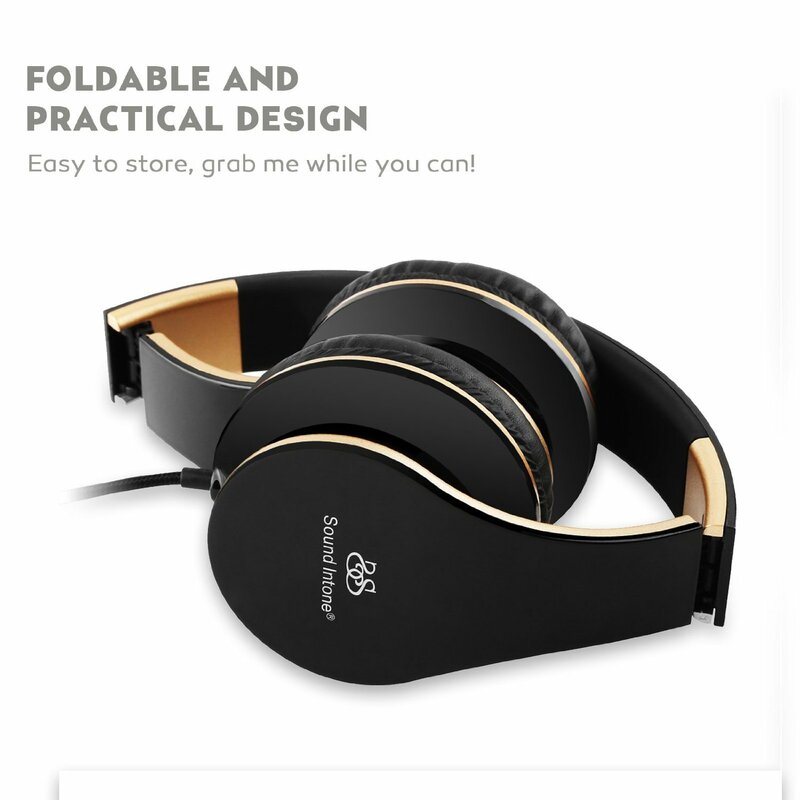 Recently, I’ve been donning the Sound Intone i65 Headphones (Black and Gold) during those long periods of music time. Our good friends Sound Intone provided me with the i65 headset to try out and review. I’ve been using in ear headphones recently so it’s a nice change of pace to use a headband, over the ear cuff headphones. But before I go into my experience, let’s talk specs. First off, the Sound Intone i65 Headphones are very, very stylish. The main headpiece is made with a glossy, yet durable plastic that looks very sleek, while the over the ear cuffs seem to be made from thin, yet extremely comfortable leather (could be faux leather). The headset as a whole just screams quality. I also am a fan of the fact that they fold up. Because I travel a lot, I need them to either be on my head or fit comfortably in my laptop bag. It’s better to have a compact set of headphones that can be stored away easily than one that can’t. A lot of us simply don’t have the space to store unfoldable headphones. As a matter of fact, it’s just too much of a hassle. And even if you do have the space, you worry about them breaking because they are not flexible. You don’t have to worry about that with the i65 headphones. The i65 Kung Fu Folding action is perfect for on the go storage! I placed the headphones over my head and noted that the headband adjusts to fit comfortably. Nothing out of the ordinary here. Also, the ear cuffs are extremely comfortable. And I do mean EXTREMELY comfortable. I wear glasses and I rarely take them off so when I’m wearing these, I need to make sure that I am going to be comfortable. I’ve ditched over the ear headphones in the past because they applied to much pressure and the handles on my glasses were being pressed up against my head. It would hurt. It sucked. So I just wouldn’t bother wearing those types of headphones. That is not the case here. The pressure is there, but it is also comfortable. The leather allows my ears to “sink in” to the ear cuffs so even though the pressure is there, it does not hurt or feel uncomfortable. Win-win situation for me! Now, that cord… that cord is soooooo long. I’m 5 feet 9 and that cord hung well below my knee when I put on the headphones. I plugged it into my phone and then wrapped the cord around it a few times to keep the wire under control. I’m not going to lie, I didn’t like doing that. It made my phone feel a bit bulky while in my pocket. I decided to try and tuck the wire in my shirt to avoid having it all over the place and though that worked better, I still had to wrap the wire around the phone a few times to not have the wire peek out from under my shirt. Hmmmm…. Sorry, friends. No Bluetooth connectivity here. Once I tamed the wire, I started to go through my usual musical preferences. I go through a wide range of music to really get a good feel for the sound quality of headphones. I tend to go through some heavy metal stuffs to get a feel for highs and mids, R&B music for a warm sound, some dance music to get a great sense of the lows, and some classical music to get an overall musical experience. After going through the genres and listening to hours of music, I came to the conclusion that the sound quality is… just shy of exceptional. Though the music sounds warm and inviting, there were a few moments when the sound was just not clear. It was a bit muddy and though I could distinguish between the different sounds, it felt that some of those sounds blended together. In my opinion, music should have distinct sounds working together, not fused together. This was more evident during my classical and rock music sound test. I didn’t get that blended sound with other genres, which I thought was a bit weird, so I figured that maybe it tends to happen during music with plenty of highs and mids. As for the non music test… no complaints at all. Voices came out loud and clear during shows, movies, and podcasts. Top notch quality when it comes to voices. The control bar is about an inch and half long and, when the wearing the Sound Intone i65 Headphones, it sits about 3 inches or so away from the mouth. As previously mentioned, the control bar has a sliding switch to control the volume. This is pretty cool, actually. I’m so used to seeing buttons that seeing a sliding bar was refreshing. It also allowed for greater control when adjusting the volume. 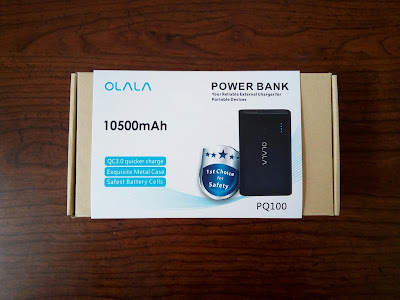 You can quickly go from loud to nothing in less than a second and it makes it super easy to adjust the sound when someone is speaking to you or you need to hear instructions. I found this invaluable during my commute to work. Many times, I’ll have the headphones on and the bus driver would give out information over the PA system. Once I see the light come on, I can quickly lower the volume to hear the announcement and then turn them back up once I got the message. This is better than fumbling for a button or taking the headphones off. Once on, I DO NOT like taking off the headphones. Those of you that wear over the ear headphones know what I’m talking about. Once you’ve gotten the groove set in the ear cuffs, you don’t want to readjust. Having the sliding switch to adjust volume at such an accessible away avoids this. The mic itself is a little tiny thing. You can barely see the pin sized hole where you should be speaking into and the whole sits closer to the top of the control bar. I would assume it is so that it can pick up your voice better. Now, there is a single button on the control bar. Since there are no instructions, I took the time to try and figure out what it does. After messing around with it, I found that the button serves as an answer/hang up call button and a pause button. I tested long pressing the button in hopes that it will skip the song forward but that didn’t happen. Not being able to skip forward or backward was a bit of a bummer. Once I get settled into listening to music, I don’t want to pull out my phone to change the songs. I would like to be able to do it directly from the headphones but these simply do not offer that option. Because the control bar has a mic, I figured it would be good to test during a call. I asked the wife to give me a call to test it out and after pressing the button on the control bar, I was good to go. Even though the mic is only about 3 inches from your mouth, I had to bring it a bit closer from time to time so that I can be heard clearly. Hmmmm… I’m sure that if I just spoke a bit loudly, it’ll be find, but I don’t want the world to know my business. Other than that, I was able to hear the call loud and clear and when I spoke a little more loudly, I came in just fine. Though you can use the headphones for calls, I just wouldn’t bother. But come to think of it… you know where I see the headphone’s mic coming in handy? During gaming! I did a real quick test online chat during a Black Ops II gaming session and I was able to hear and chat with my online buddies with ease. I figured that because you speak more loudly while gaming, this is where the mic would shine brightest. Not too shabby, friends. This can double as a gaming headset! Just make sure that you can use a 3.5mm jack!!! Well… since the headphones are wired, there is no need to worry about battery life. As long as your device is still running, the Sound Intone i65 Headphones will continue to belt out the tunes. So there you have it, friends. 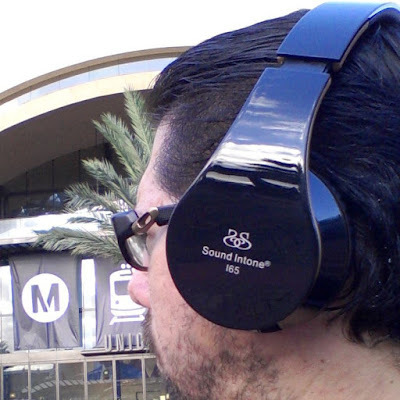 My experience with the Sound Intone i65 Headphones. This is a great sounding, great looking, and extremely comfortable set of headphones. Unless you are extremely picky about having buttons on your headphones, you should definitely consider picking a pair of these headphones. 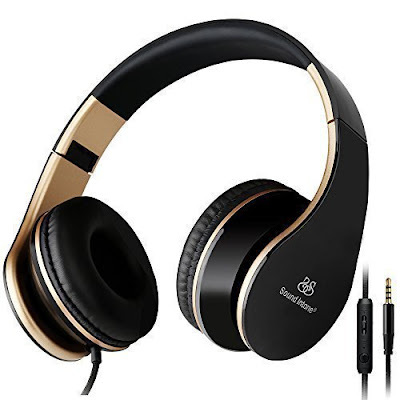 You can pick up these headphones at Amazon for under $17 and that price, you just can’t go wrong. The sound may not be exceptional, but really, only the most fine tuned ears are going to notice and let’s be honest with ourselves, friends… the majority of us are not going to notice. Lol So what do you guys think? What do you like about this headset? What don’t you like? What are you experiences with over the ear headsets? Let’s hear it in the comments, friends! Later!